The Mates – Great Australian Yarns series is a collection of enjoyable light-hearted junior novels for those starting to venturing into “bigger then picture book” reading. Each has a great Aussie feel and in this case a touch of history. Back in the days of bush rangers life was a bit different. Life was pretty tough and some folks took to being a bush ranger in order to survive. Some became quite the hero though as they sometimes do. Captain Blunderbolt however was a bit of a joke. 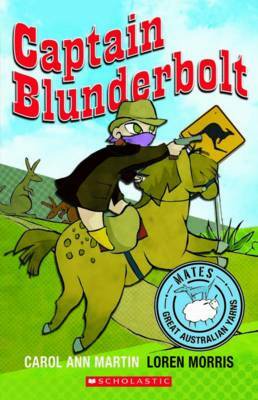 Captain Blunderbolt was not good at riding, or anything that a bush ranger should be good at for that matter. But being a good natured sort most people like him. One day things threaten to got pear shaped when Constable Flake sets a trap. Can Alberta and the other kids warn Captain Blunderbolt and stop his impending capture? And just why is he so familiar? Captain Blunderbolt is a great easy read. Bold and fun illustrations through out compliment and enhance the story by adding to the humour and fun. A great book and a wonderful series for home and school.